'Meadows Business Park' Purchase Price includes 1157 SQFT Strata Unit with Improvements. A wide variety Businesses could easily be hosted in this fantastic visible location. Possibility to nearly DOUBLE the Square footage by adding a second mezzanine level. 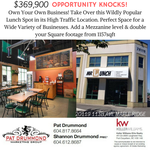 A Profitable Lunch Restaurant Business is the current occupier and an Amazing Opportunity is Presented to Replicate this Successful Business in its High Traffic Location. All Restaurant Equipment is available and negotiable, giving you the perfect Opportunity to Chase the Dream of being your Own Boss & Landlord. Close access to the Golden Ears Bridge, #1 Highway and Business Park. Invest in the ever expanding population base of Maple Ridge & Pitt Meadows. Only minutes to Langley & Surrey.